On Dec 19, 2018, the County is presenting their Update to the Circulation Element of the Napa County General Plan. A principal change in the Update is from the use of Level of Service (LOS) as a metric of project traffic impacts to Vehicle Miles Traveled (VMT). Vehicle Miles Travelled was one impetus in the development of this "Remote Wineries" page. The actual distance travelled by visitors and employees from the Silverado Trail to the Mountain Peak Winery was, at least to me, one argument against its location at the end of our road. Since then the State, in its concerted efforts to confront climate change, revised its CEQA guidelines to consider distance traveled to a project as an issue worthy of quantification and of mitigation if necessary. The County is now developing its VMT metrics and mitigations. I have updated this page to include VMT of individual remote wineries from the nearest State highways (or the Trail) along with a total. How the county will choose to measure distances travelled is unknown. Arguments can be made that it should be made from the nearest highway, from the center of Napa, from the nearest county border, from the bedroom towns, from the major cities or indeed, as the case has already been made and upheld in court, from the country of origin of the traveler. At the Sep. 16, 2018 Board of Supervisors meeting, Planning Director Morrison, in response to concerns voiced by the Supes, asked them formally for direction in crafting "remote winery" regulations, now being referred to as "winery compatibility" regulations. It is the beginning of a months-long process to try to address the increasing number of wineries being proposed in the watershed areas, like Mountain Peak, and the increasing pushback from residents who feel that the quality of their lives will be diminished as their rural neighborhoods are commercialized for tourism use. SCR will be following the County's winery compatibility issue here. On October 8th 2017 most of Soda Canyon burned as part of one of the largest wildfire events in California history. Ferocious winds spread the fire at such a rate that residents had only minutes to exit the canyon. In the process a fallen tree backed up traffic on the road with flames all around. Trucks fortunately were able to pull the tree enough to allow passage and avert disaster. But the concept of "access constraints" and "remoteness of location", upon which residents opposition to the Mountain Peak winery was based, became a very tangible and potentially lethal concept. Residents recognize the dangers of the road and accept them as the price of living in such a bucholic environment. But, as Yeoryios Apallas precient letter-to-the-editor on Oct 5th cautions, this is not an appropriate risk for tourism commercialization. The County government, unfortunately, feels that risk is offset by the need for business promotion and tourism development in the watershed areas. At the 5/23/17 Mountain Peak BOS hearing in which we presented the conclusions to be drawn from this Remote Wineries page, Sup. Wagenknecht suggested that county staff possibly consider standards for "remote" wineries. While the suggestion seemed a bit off-the-cuff, Dir. Morrison seemed eager to take on the assignment. Given this letter to the planning commission two years ago prior to APAC (which anticipates the work done on this page, and which I had completely forgotten about - subconscious plagiarism?) and his valiant efforts during APAC to create predictable development standards for wineries, I want to believe that the fire for true long term planning consistency regarding winery development was not stamped out by the BOS's "case-by-case" cave-in to the industry after APAC. "To insure that the intensity of winery activities is appropriately scaled, the County considers the remoteness of the location and the amount of wine to be produced at a facility when reviewing use permit proposals, and endeavors to ensure a direct relationship between access constraints and on-site marketing and visitation programs"
At the Jan 4th 2017 Planning commission hearing for the Mountain Peak Winery, residents presented a critique of the "comparable" wineries proposed by the County and by the Applicant. The Soda Canyon Community has consistently maintained that, given the access constraints, the intensity of winery activities is not appropriately scaled in the the Mountain Peak proposal. In response to the approach of looking at a very small subset of wineries as comparables, we have tried here to take a look at winery development in the watersheds as a whole and see how Mountain Peak might compare. This is a map and list of "remote" wineries in Napa County, "remote" being those within the hilly areas of the watersheds and more than 1 mile from a major highway. (For comparison, the average distance between Hwy 29 and the Trail is 2 miles). It excludes wineries on the Hwy 12 corridor, outside watershed areas. The map and list of remote wineries have been made using data from the NVV's excellent map here and the County's winery database here. There are, of course many more wineries not shown on the NVV map that become visible when you zoom in close on Google maps. It is probable that the average and median values would fall rather than rise or stay the same as more un-shown wineries are added. All wineries with a greater capacity than Mountain Peak are pre-WDO. Distance on Dead End road: 8th. 3 miles further up a dead end road than average. 2.5 x the visitation of the much larger Antica Winery. In summary, while the applicants on the Mountain Peak project argued that their numbers fell in the middle range of the comparable wineries that they selected and that were presented by the County, the reality is that, as the particulars of selected wineries are looked at and as watershed wineries are looked at as a whole, the Mountain Peak capacity and visitation numbers are at the extreme upper end. 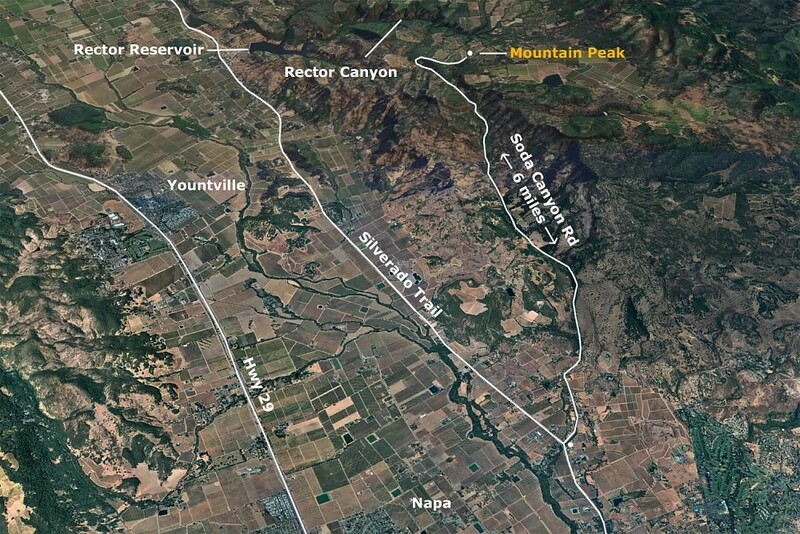 The Hess Winery jumps out as representing the development extent possible, in capacity, visitation and non-agricultural activity in the watersheds. The William Hill and Antica Winery, built about the same time, are the second and third largest wineries in the watersheds. All 3 were built shortly before the the discussions leading to the 1990 WDO, and they might be seen as examples of the unregulated winery expansion trend that the WDO was meant to address. Antica, then called Whitbred, was met with considerable neighborhood opposition. Woolls Ranch (approved in 2013 and as yet unbuilt) is the visitation leader in post-WDO remote wineries. It was vehemently opposed by the residents of Mt. Veeder Road, and as such is very comparable to Mountain Peak, representing the current discretion of the County in promoting the interests of one good-life entrepreneur over a community of impacted residents in the shift from wineries as production facilities to remote and scenic entertainment venues. The Palmaz winery is the second highest in post-WDO visitation. Another good life plutocrat (who just can't seem to stop causing grief for his neighbors, the County and the Napa citizenry) also vigorously opposed by the neighborhood when it was proposed. And Vineyard 22? A 10000 g/y winery with 350 vis/wk visitation? What's with that?